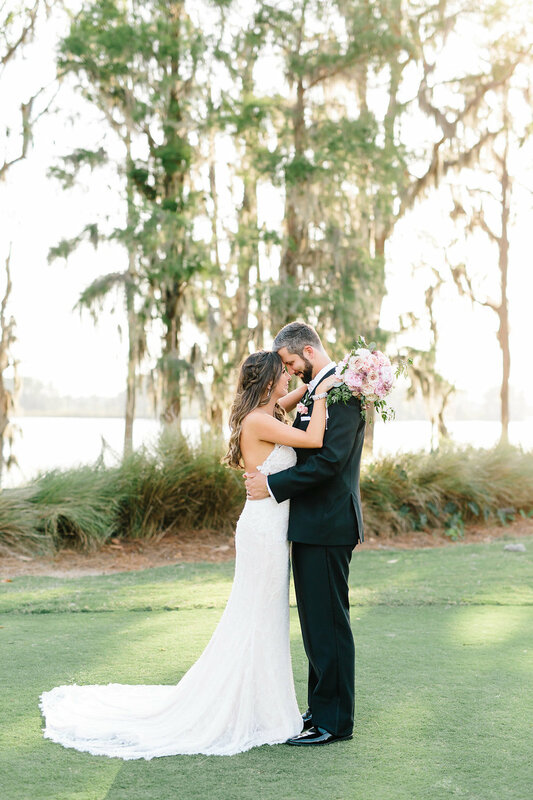 If there is one thing that we remember about Julianne and Garrett’s April wedding at Isleworth Country Club, it’s the sweet romance that filled the air from dawn to dusk. 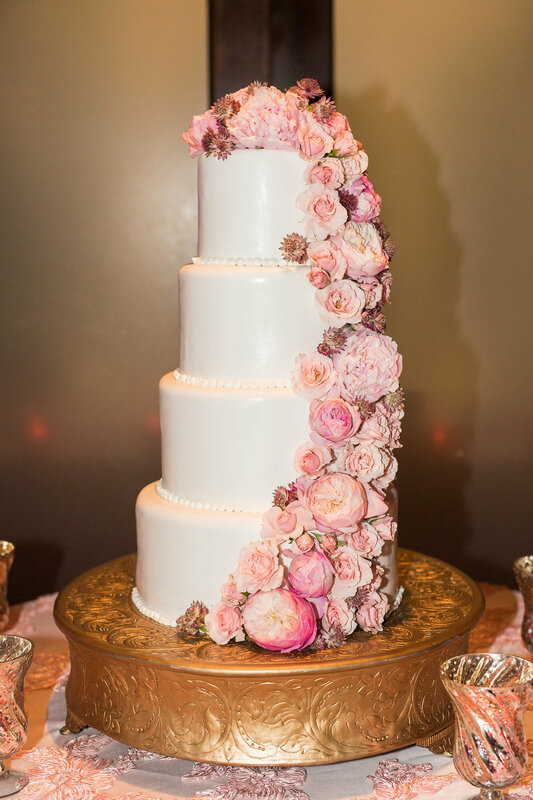 Julianne and Garrett chose a pink, ivory, and natural greenery palette that Lana created a design board for - inclusive of open garden roses, peonies, and hydrangeas. Julianne’s handtied bridal bouquet was filled with pink garden roses and peonies accented with loose greenery for a soft touch. Julianne’s Bridesmaids wore blush pink dresses and carried smaller versions of Julianne’s bouquet. The Bridesmaids also wore delicate floral halos - perfect for the outdoor garden ceremony! Stunning blooms on grand pedestals and a framed welcome mirror greeted guests as they took their seats along the rose petal aisle for the ceremony under a gold wrought iron arch adorned with flowers and greenery. After the vows, Lana and her team redesigned the ceremony flowers to bring the beauty inside. A lush sweetheart table splashed in pink light and surrounded by the garden flowers with greenery accents made a stunning impact in front of the fireplace. The mantle was adorned with candles and a custom faux botanical monogram which the couple commissioned for their home after the wedding. Planned and coordinated by Michele Butler, from Michele Butler Events, the wedding was exceptionally prepared and executed - making for a wedding day that “was the moment of our lives,” says Julianne. Even though the day was warm, everyone stayed calm and cool - primarily because of the extraordinary planning and efforts of Michele. Michele is a consummate professional and remains joyful and positive throughout the entire pre-planning and day-of coordination process. It is truly a delight to work with her as she makes it seamless for a vendor (such as ourselves) to do our best work. When it comes to romance, it doesn’t get much better than a couple that is as beautiful inside as they are on the outside, add in a beautiful ceremony overlooking the lake, highlighted by soft pink hues and lush arrangements and you’ve got the perfect recipe for a romantic wedding!